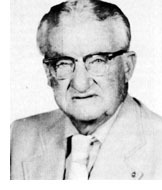 Forddy Anderson was one of the great college basketball coaches of his generation, and he was the first coach ever to lead the Bradley Braves to a number one national ranking. 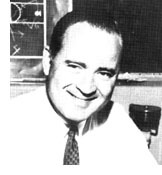 He coached at Bradley for six remarkable years and compiled a brilliant 142-56 record during that period. His 23-win average is one of the winningest totals in college basketball history. His first three Bradley teams actually averaged an unprecedented 30 wins a year as they rolled up records of 27-8, 32-5 and 32-6. His 1949-1950 team remains the only team ever to finish second in both the NCAA and NIT Tournaments. His last Bradley team, the 1953-54 team, duplicated the second place NCAA finish, finally bowing to a powerful LaSalle team in the championship game. Following his successful Bradley career, Anderson went on to earn the respect of the Big Ten as the head coach at Michigan State University, and he later became a professional basketball scout for the Golden State Warriors.